Creativity is required in many fields of endeavor—especially industry and scientific research. 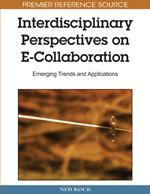 Creative tasks we consider in this article include not only creative tasks by single individual or multiple individuals, but also collaborative tasks accomplished by a group of individuals with support of e-collaboration technologies. The difficulty of formulating new ideas calls for the development of an environment that supports creativity. Moreover, it is known that people tend to become more creative when they use words that are related thematically rather than taxonomically. In light of this, we sought to extract lists of words having a thematic relation. In this article, we propose a method of extracting such word lists and verify, through Web retrieval, that word lists with a thematic relation can support creativity. The verification method is based on the belief that we can acquire certain knowledge if a word list directs us to informative Web pages and the knowledge included in such pages is useful and can itself stimulate creativity. As a result of our experiment, we report that our methodology can extract word lists available to support creativity.